General Description of Milk Fat Globule. Recognizes a protein of 40-45kDa, identified as human milk fat globule membrane protein (HMFG). 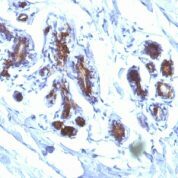 HMFG is present on normal human breast epithelial cells, cell lines derived from breast carcinomas, as well as to the outer surface of the human milk fat globule. HMFG is considered as a differentiation marker. 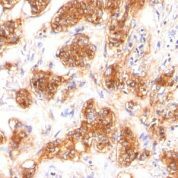 It is useful as specific breast epithelial marker, can also provide a tool to study the role of the cell surface in normal, neoplastic mammary development. Anti-MFGE8 antibody staining is expected to be primarily localized to the cytosol. 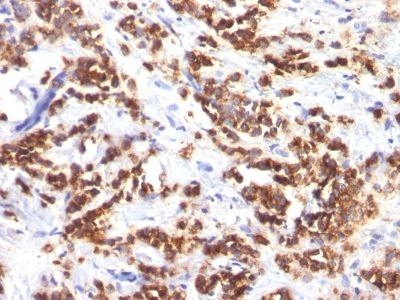 Tissues from cancer patients, for instance, have their own distinct pattern of Milk Fat Globule expression as measured by anti-Milk Fat Globule antibody immunohistochemical staining. The average level of expression by tumor is summarized in the table below. The variability row represents patient to patient variability in IHC staining. enQuire Bio's Milk Fat Globule Anti-Human Monoclonal is available for Research Use Only. This antibody is guaranteed to work for a period of two years when properly stored.